Late morning in the Whiskey Troll Tavern, Dravor the blackguard and Jíen the necromancer were eating a breakfast of stewed stringy gray meat, probably rat, tough coin bread, and whiskey fortified ale. Trantox the assassin swooped in and sat at the table joining his compatriots. The Poisonwood assassin turned to the young necromancer. Jíen did as he was bid but as a favor. The weapon had a razor sharp serpentine starmetal blade with decorative runes winding up the cheek and a finely wrought gold guard and gold-wire wrapped grip with a strange purplish-black stone as pommel. The Deadlands necromancer visibly tensed as he touched the weapon and after summoning up the best of his arcane knowledge, almost spasmodically he slid the thing back to the assassin. The assassin snatched it up and tucked it under his cloak quickly surveying the half empty tavern to make sure nobody saw the item. Jíen told Trantox that the weapon was intelligent and evil to boot (also a +2 weapon). The assassin was affected by a strange and disturbing (in Jíen’s opinion anyway) sort of glee. Trantox immediately slunk away softly giggling. The necromancer was suspicious that the weapon’s ego was already taking root in the assassin’s mind. A little while after the assassin left the tavern for destination unknown the blackguard casually pointed out a corpse slumped against a pillar to the necromancer. Upon investigation the corpse appeared to be a murder victim with a gaping wound in the back, its feet bare, and the tethers to its missing coin purse cut. So, naturally the necromancer dragged it back to his tomb under the pretext of delivering it to the charnel house. It took until evening to animate the corpse, programmed with a mission of vengeance against the one(s) responsible for its death whoever they may have been. Frankly, it was just something for the necromancer to occupy his time. A short while after the thing stumbled off into the streets Jíen made a beeline back to the tavern. The Troll was packed it was again a familiar but reeking, as if it ever smelled anything but bad, sea of yellow light. After wading through the congested haze the necromancer quickly found a seat near the wall where hung the giant spiked club and near the always vacant and bone dry carven table. The place was noisy with agitated conversation and excited argument. The atmosphere as taught as knotted troll-gut, everyone was anticipating the games. There were Westlanders, Ivorans, and various others of all stripes most wearing cheaply dyed sashes painted with the heraldry of their favorite fighters marking them as games fanatics. Then a fight broke out between the members of what appeared to be an adventuring group. Jíen spotted an unrolled parchment upon their table, the apparent source of ire. The young necromancer tried to keep an eye on it to see if anyone snatched it up. Eventually a few of the adventurers ended up dead and the others fled. Somewhere in this Jíen had lost track of the parchment and only realized too late that it was gone. It wasn’t long after that before a duel between two pirate swordsmen broke out. Weary with boredom the necromancer took his leave of the place and retreated to his tomb. He spent the night preparing his fighter, making sure its makeshift stomach, a wineskin, was secure and filled with red wine. Come morning the necromancer found himself breakfasting alone. Just as he finished eating Trantox stumbled to the table. He was covered in blood with a serious gut wound. A fat sack of swag tucked under his left arm. With his usual uncanny sense of perfect timing the bard, Rantcor wandered in and sat down with the necromancer and Poisonwood assassin. He passed Trantox a small vial of healing potion. He told the assassin to meet back up with him at the Broken String at midnight. To maintain appearances the bard signaled for a round of whiskey fortified ale for the table. Jíen engaged the bard in some small talk about a few odds and ends eventually turning the subject towards the upcoming games. The necromancer also found out that the underdog was one Blood-Axe with 12 to 1 odds. He was a half-faun from a place called Rockhollow or somewhere thereabouts. The bard took his leave soon after that. A few minutes later, a few of the city guard chased some “scumbag” thieves into the tavern from the street and thought that they had cornered the rogues who still were able to slip away. Come midnight, Jíen found himself accompanying the assassin to the Broken String. The place was low key and quiet as usual with the same drunk passed out at the bar and the same faun bartender on duty. Exotic incense still perfumed the air that the necromancer found repulsive in its sweetness and for the first time he noticed that, the plastered walls were lavender in color. Quite the expensive pigment, he thought. Already there, Rantcor waved them into a private booth. Trantox placed his sack on the table and slid it across the table over to the shady bard. He peeked into the bag shifting it a little here and there, inspecting its contents. After a few seconds, he produced a leather sack of his own and poured out a measure of gold coins. Nothing could make the necromancer’s eyes gleam more but a beautiful corpse or a pile of newly struck gold. In total, the bard insisted that Trantox count them over a bottle of wine, the assassin had netted 3,600 gp. Trantox bagged the money and placed the purse inside of his shirt next to his heart. Rantcor then took it upon himself to give the hapless assassin a “head’s up”. The assassin shrugged it off meanwhile Jíen shot the assassin a wide-eyed WTF glare. The Shakai were the premier assassin’s guild of Xuun. 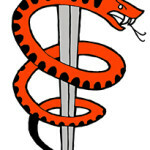 Their emblem, a dagger with a red serpent coiled about the cold blade. The necromancer sat stunned while the bard took his leave. Trantox unconcerned went to haggle with the faunic bartender for some healing potions. After he was able to recover his senses, Jíen quietly slipped away back to his tomb.